Sometimes you just don't want to spend much time on finding the ideal EQ settings (and, with beasts like IIEQPro and LP10, you can easily lose yourself in all the options), but just turn a knob and know it will sound right, because someone else has figured out the most musical response for you. In the case of the 6144, this person has been the designer of the Neve Portico 5033, which was the role model for this software EQ. Hats off to the man! Unique gain-Q-interaction and custom made low- and high shelf filters make sure you can apply even extreme settings without getting harsh or muddy results. Add a little bit of saturation for that extra warmth, et voila! 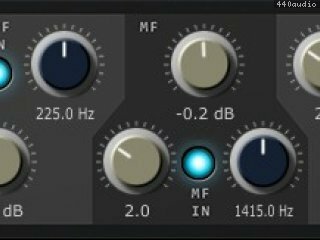 All DDMF plugins are now available in RTAS (Protools) format (except the plugin chainer Metaplugin, for legal reasons). The new format is available for all owners of the current versions for free, just like that, de nada. AAX (the upcoming Protools format) versions will follow later this year, this update will also be free.